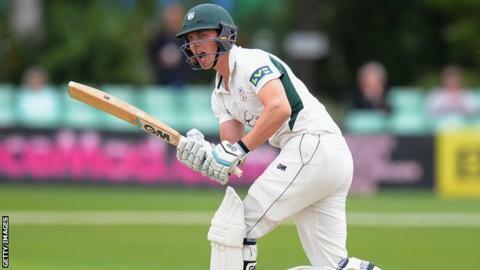 The 21-year-old is Worcestershire's leading run-scorer in the County Championship this season with 802 runs. "It's great that so many young guys have signed new contracts," Fell said. "It's good for the future of the club and I think everyone is really excited at the moment." In 2013, rain denied Fell a maiden first-class century against Kent, leaving him unbeaten on 94. Fell began 2015 with 114 against Yorkshire at New Road and then scored a career-best 143 against Middlesex at Uxbridge. Fell, who had a year left on his previous contract, follows seam bowler Ed Barnard, wicketkeeper/batsman Joe Clarke and all-rounders Joe Leach and Ross Whiteley in signing a long-term deal with the county. "Backing these guys to do the job for the club for the next few years and trying to put us in a good position is excellent," he said. "It is an exciting time having such a good group of young players so hopefully we can take the club forward." Fell broke into the Worcestershire first team during the 2013 season and was a regular member of the promotion winning side in the Championship Division Two last summer.